You cannot create an active full backup if a backup task of any type is currently running. This includes a scheduled backup, standalone full backup, active full backup or ad-hoc incremental backup. A user account under which you start the Active full backup operation must have administrative privileges on the Veeam Agent computer. If the account under which you are currently logged on to Microsoft Windows does not have administrative privileges, you will be prompted to enter administrator credentials. In the main menu, hover over the name of the backup job that you want to use to create an active full backup, and select Active full backup. 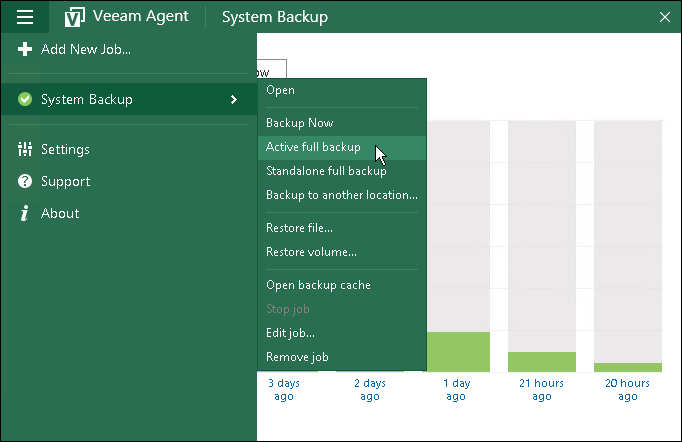 Veeam Agent for Microsoft Windows will create a full backup file using settings of the backup job and add this backup file to the backup chain. Select Backup > Active full backup.